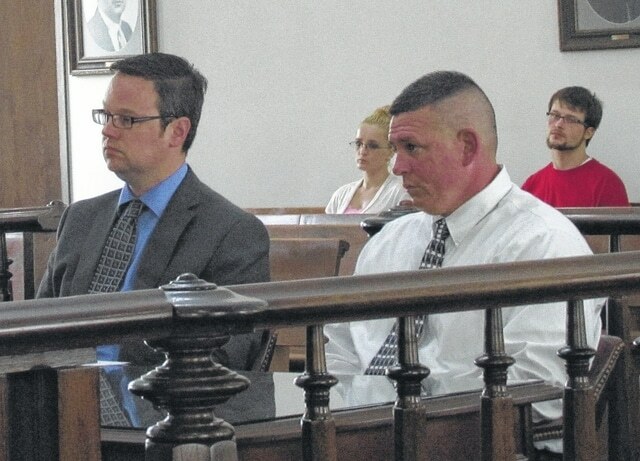 Timothy Franks is pictured in Highland County Common Pleas Court on Thursday with defense attorney Denny Kirk. Amy Lamb and Jordan Reffitt are pictured in the background. A Hillsboro man who the court initially intended to sentence to community control was sentenced instead to nearly a year and a half in prison Thursday. Timothy E. Franks, 41, received an eight-month sentence for fifth-degree felony heroin possession, and a nine-month sentence on a fifth-degree felony breaking and entering charge. He pled guilty to the latter charge on Thursday and Highland County Common Pleas Court Judge Rocky Coss said that, per the plea agreement, the state would not oppose community control. Coss said that community control had been his intention, until he reviewed the presentence report, which had been ordered when Franks pled guilty to the possession charge at a previous hearing. The judge noted Franks’ record, which includes a 2008 conviction following his termination from intervention in lieu of conviction on a Greene County case. Coss also noted other offenses, including the two most recent before the court. Additionally, Coss said Franks had active warrants out of Clinton County. He said that, according to Franks, the termination from treatment was essentially a matter of theological differences. Kirk said that Franks contacted him immediately after he was terminated from treatment, and has since been to FRS to continue counseling. The attorney noted that all the defendant’s drug screens have been clean. “I did everything I was asked to do,” Franks said about his time at the facility. He said was doing well there. Franks said he had specifically sought out a faith-based program and indicated that having the faith aspect with treatment was important to him. “I think the problem is you’ve skated too many times,” Coss said, adding later that Franks has had enough opportunities to turn things around for himself. In addition to the 17 months in prison, Franks is also responsible for $3,584 in restitution. Three other defendants were also sentenced on Thursday. Amy B. Lamb, 29, Hillsboro, was sentenced to community control and the STAR program. She pled guilty to third-degree felony illegal assembly or possession of chemicals for the manufacture of drugs and fifth-degree felony aggravated possession of methamphetamine in a previous hearing. Jordan Ray Reffitt, 27, Hillsboro, was also sentenced to community control and the STAR program. He previously pled guilty in two separate cases to heroin possession, a fifth-degree felony, and aggravated trafficking in drugs, a fourth-degree felony. Melissa K. Harris, 24, Xenia, was sentenced to community control and ordered to attend a residential treatment facility following her admission in a previous hearing to violating the terms of her intervention in lieu of conviction, which she was granted a year ago. In other hearings, three defendants were terminated from intervention in lieu of conviction after admitting to probation violations. Terry Olderham, 62, Hillsboro, admitted to a recent conviction in Fayette County Municipal Court. He will be sentenced on fifth-degree felony vandalism in August. He was initially granted treatment in lieu in September after pleading guilty to that charge. Jonathon Blake Pursley, 27, Sabina, admitted to testing positive in April for opiates and Suboxone, neither of which he had a prescription for. He will be sentenced in August on fifth-degree felony possession of heroin. He was granted intervention in lieu in September following his guilty plea. James E. Tong, 37, Hillsboro, admitted to probation violations that included not reporting to the probation department and failing to complete treatment. Tong pled guilty to fifth-degree felony heroin possession in November and was granted intervention in lieu. He is also set for sentencing in August. Bradley Kent Cox, 35, Washington C.H., did not appear for a hearing and a warrant was issued for his arrest. Cox pled guilty to fifth-degree felony forgery a year ago and was admitted into the prosecutor’s diversion program. In a notification hearing, Jeremy W. Boyd, 27, Hillsboro, waived his right to have an attorney and admitted to probation violations that include testing positive for drugs multiple times, not reporting contact with law enforcement, and failing to complete treatment. He pled guilty to fourth-degree felony aggravated trafficking in drugs and was sentenced to community control in June 2014. He will be assessed for STAR and sentenced next month.